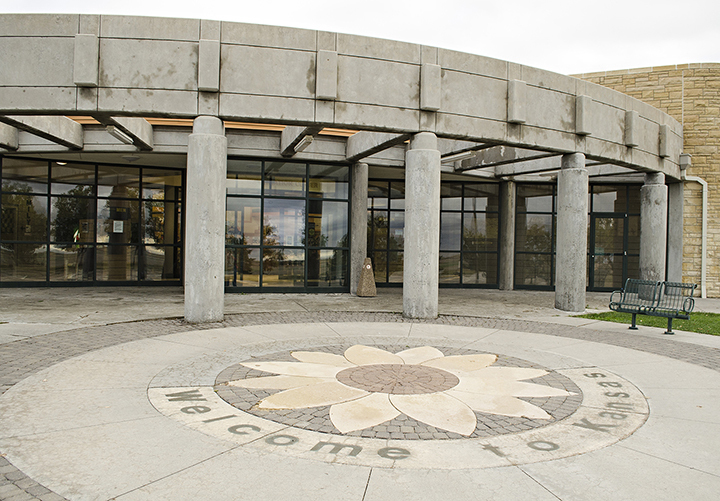 A sunflower outside Goodland Travel Information Center welcomes visitors to the Sunflower State. "I always tell people, 'We are cheerleaders for Kansas,'" Mona Carver, Travel Information Centers Program Manager, said. She was talking about the staff at the Goodland Travel Information Center (TIC) 10 miles west of Goodland on Interstate 70. "We might be the only people they talk to in Kansas. We want to make sure they have a good impression of our state." TIC staff's goal is to encourage people to spend more time and money in Kansas. July is TIC's peak month. "We can easily see 800 to 1,000 people per day in July," Carver said. Over a year, 125,000 to 150,000 people will use the facility. This year TIC staff have handed out over 30,000 Kansas maps and over 25,000 Kansas guidebooks. They offer free coffee and tea. On a late October Thursday, they had brewed 10 pots of coffee. Each pot holds 18-20 cups of coffee. In the summer, they'll brew 25-30 of those pots. Mona Carver (left) talks with visitors from South Carolina. "What can we do in Kansas?" "We find out TIC visitors' interests and try to engage them," Carver said. "Their questions will tell us whether they are interested in art or nature or something else." 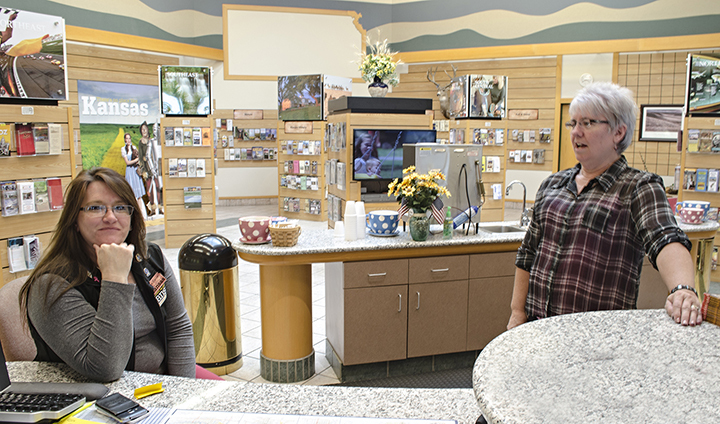 Goodland TIC is stocked with 392 brochures about the state and its attractions. People look at the brochure displays and are amazed by how much Kansas has to offer. Carver said, "I tell them, 'This is all Kansas. This is only a fraction of what Kansas offers. We can't hold all the brochures that are out there.'" Brenda Smith visits with a pair of travelers at the coffee pot. With the state's Tornado Alley reputation, strong winds generate questions about tornadic activity. People who have vehicle problems ask about auto repair and towing companies. Some ask about lodging and restaurants. TIC staff assists travelers with all these issues. "We have to know road conditions, weather forecasts, lodging and dining information," Carver said. "Where can we eat now?" When a traveler asks about places to eat, staff asks whether they want to eat now or down the road. "I tell the staff to use their personal experiences. Plug the places you like. If you've had an excellent experience somewhere, share it." If the visitor wants to eat now, staff steers them to Goodland restaurants. Those who need vehicle repairs learn about Goodland repair shops and towing companies. Goodland especially benefits from its Mountain Time Zone. 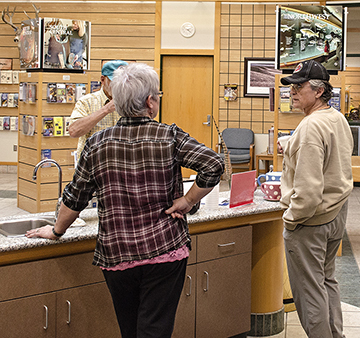 After 3 p.m., the only place travelers can reach during business hours is Goodland. Especially after 3 p.m., "we plug Goodland all the time," Carver said. They send people to the van Gogh painting and High Plains Museum. Many people have heard about the painting and are anxious to see it. Dorothy and the rest of the Wizard of Oz cast stand behind Carver and Smith. Several selfie opportunities are available at the TIC. A "Welcome to Kansas" road sign stands near the TIC's front door. Dorothy, the Cowardly Lion, Scarecrow and Tin Man stand in front of the Yellow Brick Road with "Welcome to Kansas" written across the sky. A pair of ruby-red slippers and the Wicked Witch of the West stand off to the side. The Wizard of Oz cast is a big draw for adults. "They make a beeline for Dorothy." Visitors have brought in selfie props such as their stuffed animals, a pumpkin with a pacifier used for a birth announcement, a Yorkie in a basket just like Toto and other items. One area has Halloween decorations and some people have taken selfies with those. TIC has three full-time staff and three temporary staff. Temporary staff is limited to 999 hours a year. Staff are members of Kansas Department of Wildlife, Parks and Tourism. Kansas Department of Transportation (KDOT) owns the Travel Information Center building and does all its maintenance. "They take care of us," Carver said. "We have a good relationship with KDOT." "People compliment us all the time about its cleanliness," Tourist Counselor Brenda Smith said. "They ask whether the building is new because it's so well kept." Building is actually 13 1/2 years old. It opened in April 2002. 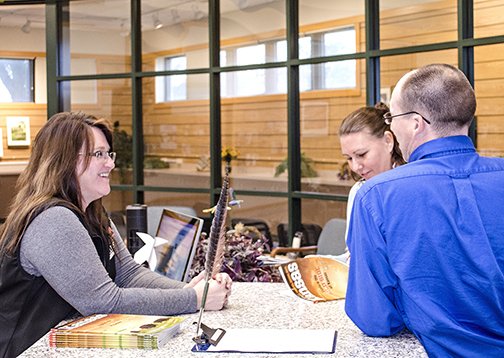 Goodland Travel Information Center is open 9 a.m.-5 p.m. in the winter, 8 a.m.-6 p.m. in the summer. It stands at Milepost 7 along eastbound Interstate 70, 10 miles west of Goodland. Call 785-899-6695.